Sally English, Associate Broker at Realty Associates of Atlanta LLC, listed 3075 Silvapine Trail NE, Atlanta GA 30345 in Briarlake Manor subdivision. 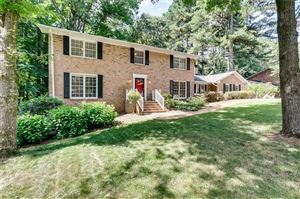 Call or text Sally English direct at 404-229-2995 for more information about this home. Sally English and the English Team specialize in homes and neighborhoods convenient to Emory, CDC, VA, CHOA, FEMA, IRS Center and Midtown. Full renovation in 2006 opened walls and ceilings to create light-filled space with multi-room views. Walk or bike to Briarlake Elementary, Twin Lakes Swim Club, and even Lakeside HS. Walking Trail at end of the Silvapine leads directly into to Briarlake Forest Park with extensive walking trails. Refinished hardwood floors throughout the main level and upper bedroom level. Ceramic tile floor on lower terrace level.Flexible floor plan with large barrel vaulted main living area, living room that converts to a dining room and the main floor office that would be an excellent Butler’s pantry. Terrace level rec room, bedroom and full bath give flexibility to multi-generation families. Convenient to Emory and CDC. Students at 3075 Silvapine Trail NE, Atlanta GA 30345 attend High Scoring Briarlake Elementary School, Henderson Middle School and Lakeside High School in the DeKalb County Public Schools System. Nearby private schools include Globe Academy Charter, IHM, Marist, Saint Pius X and Paidea – all located within a reasonable commute. We recently moved from City of Decatur, where our son attended K-2 and we have been very impressed with the level of parent involvement at Briarlake and with the collaboration between faculty and parents. Our son achieved great acedemic strides in his first year there. Briarlake has a model PTA (very difficult to achieve) and also the Briarlake Education Foundation, which also supports and supplements educational funding for the school. Briarlake has a very positive vibe going on and we couldn’t be happier in this close knit community! I am so happy to have my daughter attend Lakeside. The opportunities for AP instruction and extra-curricular involvement are excellent. The new construction has turned the school into a first class environment. The principal is extemely dedicated and deals aggressively with any negative situations that arise (as they always do in high school). Twin Lakes Swim and Tennis Community Club is a private swim and tennis facility. The club sponsors year-round tennis teams, a swim team and social events. The facilities include 6 tennis courts, covered deck, pool including a low dive and a slide, children’s pool featuring a mushroom fountain, children’s playground, concession stand, ping pong table, picnic areas, sand volleyball court, a shade awning, and gas grills for family use. 4 Bedrooms and 3 full baths. 3 bedrooms and 2 full baths up, 1 bedroom and 1 full bath on Terrace. 2982 Sq Ft per DeKalb County records. Stone walkway from driveway to front porch. Two car garage with remote controlled door – room for storage. Extra parking pad beside the garage. Koi pond with waterfall feature. Fenced backyard with large grassed lawn. Two patios. Smaller patio just outside the screened porch is a perfect grilling and or chilling spot. Second larger patio at entrance to terrace level. House is perched on a gentle upward slope – lots of privacy. Entry foyer features hardwood floors, double door coat closet with opaque window inserts, custom built front door with stain finish and three lights Premium front door hardware. Cased opening to living room. Open to great room. Flexible floor plan is most evident in the living room. Could easily be converted to your formal dining room. Open to great room with views of kitchen. Hardwood floors. Large picture window. Barrel vaulted great room is the centerpiece of this re-formulated 60s home. Just like the HGTV shows you love this room was created by converting existing space in the 60s home and an addition to gain more space and volume. This lovely living space has views of the entire main floor and will be your families favorite room. Hardwood floors, 2 ceiling fans, recessed lighting, double French doors to back yard, French door to screen porch, new windows. Modular fireplace with gas logs and pilot light for instant and clean fires. Stairs down to terrace level. Open to kitchen – and separated by a breakfast bar. Room for informal family dining table and chairs. Designer kitchen was the “soul” of the 2006 renovation. This all new kitchen features stained wood cabinets, granite countertops, recessed lighting, ceramic tile backsplash, hardwood floors, breakfast bar with teardrop lighting, under counter sink with gooseneck faucet and disposal. Double windows over sink. Cubby on opposite side of kitchen is perfect for electronics and phones. Lots of storage! Premium appliances include a brand new Frigidaire gas range with center griddle burner – black glass finish (2018), GE dishwasher in stainless steel, Kenmore microwave oven in cubby built in. Home office with entrance to kitchen has hardwood floors, window, recessed lights, Could easily be converted to a Butler’s pantry if you choose to locate your office on the terrace level. Three Season screen porch has a vaulted ceiling, ceiling fan and light, beadboard ceiling and views of the fenced backyard. Door to small patio. Turn the fan on and it cools off to a comfortable level even on the hottest days. Three season opportunity to enjoy a morning cup of coffee, read a good book or enjoy an evening meal with friends and family. Rec room is the perfect place for cartoons and movies while the adults enjoy some quiet time on the main level. Or set up your home gym, media room or special use in the well-finished room. White ceramic tile floor, windows, Door to patio. 4 windows. Painted wood paneling. Slick ceilings. Bedroom on terrace level has ceramic tile under the carpet. Double window Ceiling fan and light. Full bath on terrace level has a ceramic tile floor, white vanity cabinet, walk-in shower with ceramic tile floor and walls. Laundry room on terrace level has washer and dryer connections, window, ceramic tile floor. UPPER BEDROOM LEVEL has 3 bedrooms and 2 full baths. Master bedroom has hardwood floors, 2 windows, ceiling fan and light, double door closet, single closet, door to private bath. The renovated Master bathroom features a white ceramic tile floor, light stain finish vanity cabinet with granite countertop. Large walk-in shower with edgeless glass door and wall. Tile shower wall and floors. Bedrooms 2 and 3 are spacious with good closets. Both have ceiling fans and hardwood floors. Hall bath has a ceramic tile floor, Light stain finish vanity cabinet with granite countertop. Tub-shower combination. The home is within an easy car commute to Emory University, Centers for Disease Control, CHOA, VA hospital, Mercer University, FEMA without using any Interstate Highways. Directions from Downtown Atlanta: I-85 North to Shallowford Rd Exit 91. Right on Shallowford. right on Briarcliff Rd. Left Briarlake Rd. Left on Silvastone Dr. Right on Silvastone Trail.